This is the bitterly poisonous, growth-stunted, angry Black Jalapeno Pepper that’s growing in my back yard. It has strong objections to the “Green Movement,” preferring, instead, to skip right over that stage, ripping off its innocuous tiny white flower to burst into being as an angry red nubbin about the size of a baby ladybug. I have, in fact, seen several ladybugs attempting to mate with it. Shortly thereafter, it scowls itself into a glossy little black nubbin that looks like a bit of buckshot. This is the first one I’ve seen grow to something that looks like a pepper, and I’m pretty sure I heard the other tiny nubbins mocking it for being so fat. Later this afternoon, or some time this week, I’ll be eating it. Assuming the squirrels and birds don’t beat me to it. There may be video – if it doesn’t kill me. I’m willing to bet my life it’s delicious, despite the warning flags. Depicts a work of art that I am reasonably sure is not yet old enough to be in the public domain, unless it is shared by the artist with a Creative Commons license. Jonathan Bailey, the mastermind behind PlagiarismToday.com, has 5 Simple Rules for Reusing Content Online. If you follow those rules with regard to this blog, I will probably thank you for sharing – not brain you with a frying pan embossed with a copy of the DMCA notice. And I will try to do a better job of watermarking my images, so that it’s clear where they came from (if you look closely enough). This is a courtesy, only – I’m not using it to track infringements, but rather to put would-be “innocent” infringers on notice. If someone goes to the effort to remove a visible watermark, they’re not “innocent.” But anyone caught modifying my images or using them in some ugly, inappropriate context (watermarked or not, without explicit permission) will be brained with a frying pan embossed with a copy of the DMCA notice. Play nice, and nobody gets hurt. That clear enough? So, now, how do we do this, practically speaking – without going to horrendous effort? 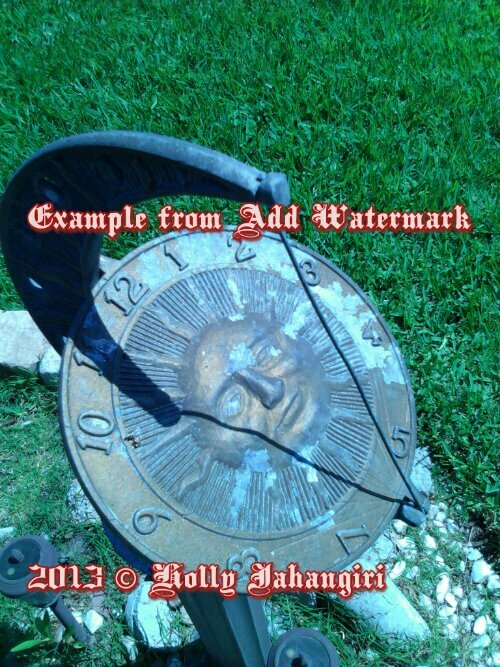 I really wish the Add Watermark app came in a Windows 8 (phone app and desktop) version. I have tried twisting Paul’s arm – he says he hasn’t got the time or expertise to port it to the Windows platform. Someone who does ought to collaborate with him. For $1.99, Add Watermark does exactly what I need – but takes that one step further. Not only does it provide robust watermarking options, it allows me to share images right through the app – watermarking them first, then sharing them through any other app that has sharing capabilities. There’s a free version, but once I was satisfied that the features worked cleanly and easily, I upgraded the app to the full version to remove all limitations. The watermark on the Deadly Black Jalapeno Pepper image, above, was created with Add Watermark. I took the photo using my HP Slate 7, quickly added a watermark, and shared it via the WordPress app. 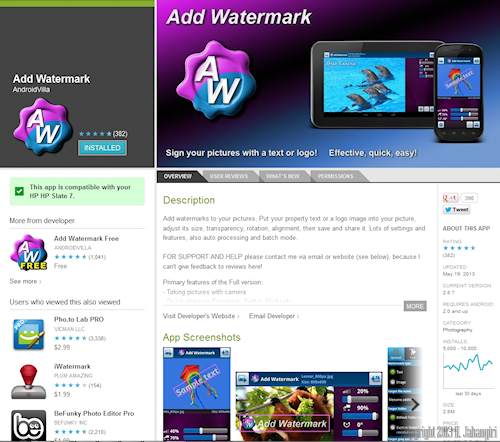 You can quickly add text – creating new or reusing a recent watermark, or you can create image watermarks to use, instead. You just save them, then select and place them. Once the watermark is placed, you can save a copy of the image and use the save and share option to go immediately to any app you like, provided it has built-in sharing capabilities. You could practically make your own memes on the fly, if you have Android, a camera, and the Add Watermark app! How My Family Photo Turned into an Internet Meme – somebody owes that child tuition money! If you know of any good watermarking plug-ins for WordPress or Windows 8, let me know! UPDATE: Teeny tiny jalapeno peppers turned out to be black on one side, normal green on the other, and about as venomous as a baby copperhead, if you know what I mean. In other words: Yummy! UPDATE 02/20/2016: The Tiny-But-Deadly Black Jalepeno Peppers are actually pequin peppers. This little plant has turned into a tree, and now yields a respectable amount of delicious hotness. I just have to beat the birds to them. Well, I would be careful about eating strange things that grow in my yard, unless I actually knew what they were. Mistakes have been made, before…. I can tell you the fascinating story of a friend who was sick for over a week with some mushrooms. He also had a trip that he claims “was to Oz and beyond”. He’d eat some again — for the trip, but the week of sickness, makes the trip ticket too expensive. His doctor told him he should have died, but was too stupid to. No comment! The watermark app? Ask Google. There are Windows XP, and 7 versions. They’ll likely work on 8. Some work on 95, 98 and even Vista Sheetza. Even easier, is a little program called PAINT, and a little program called WORDPAD. And a little program called WORD. In Paint, you have 2 choices. Create a small little graphic that says. Save it. Every once in a while, go in and edit the date. Change the date as often as you like. Load the pic into Paint. Open the Wordpad file with your little sentence. Select, copy and paste into the “A” text tool in Paint. Gussy it up. Mission accomplished. You theoretically, can do the same thing in Word, but you have to know how. Again, Google is your friend. I am an idiot, and I use Paint: it is easier. As for giving people credit for stuff? I try to. But to quote the big 4: Ask Leo Notenboom, Bob Rankin, Randy Cassingham, Anne Mitchell. Note that this “sharing stuff on line” is NOT the same as uploading the Les Miserables Cd you just bought for $40 at WalMart onto Youtube. (Howl! The sound was bad, and I only really wanted 6 of the songs!) The folks who own Les Mis will be pissed at you, and they have the resources to go after you. AND THEY WILL! You own the Cd and can listen to it, and make a backup Cd for yourself. (Well, they really, do not like that either, but, not much they can do about it. They will likely look the other way, for one copy for yourself.) But you cannot sell copies of it to others. They are not too keen on your giving it away, either. They also do not want you trading it. These are poor corporations which are only worth mere billions, not trillions, you know. Dig deep, send them a donation! “Do it Now!” to quote Ah-nold. So if people put stuff on the net, they better not expect me to do too much R&D, when it comes to giving credit. If they specifically ask me not to share, I will laugh, but humor them. As for my stuff? I rarely bother with watermarks, and when I do, I make it as simple as possible. I know that there are people who know how, who can take a silly picture of a dark tanned woman with a saber, and turn it into someone else, with a light tan, in about an hour. Worse, in this person’s hands, the saber looks even nastier. They then send me the 2nd version, with no warning of what I am about to get…. I would not mind, but the first person, I do not know, or care about. The second person, terrifies me even more than Holly does. Much more. The second person, well, I would rather take on Queen Victoria or Queen Liz I. So I know that they can take any little thing I have, and do as they like with it. Same with your stuff. I sent a guy a cartoon, once. I got an EMAIL weeks later. He had re-done the dialogue completely. I got his point. And he is a friend….. Good thing I have few enemies. And since I probably pissed off Holly with this, I am considering moving to a nice safe place where she would not follow. I hear the weather in Cuba is nice. Or maybe Chechnya. What’s that Mr J? You suggest joining the “1 way Mars Expedition”? You think I’d be ok, then? I’ll take that under advisement. You know… you’d be qualified too, sir. You’re thinking about it, too? Je comprends. Take care, Holly. The world needs people like you. Really, it does. People like me? It tolerates, so far. Theoretically, I am not a spammer. But from your side of the thinking sphere: Your mileage may vary! I commend you for eating Jalapenos, as I have zero tolerance to spicy stuff, let alone jalapeno chilis! I agree with you that watermarking photos is a great way to instill our rights to our own photos, but still thanks to photoshop and other such software, people still have a way of stealing our precious photos. Thanks for sharing those interesting articles at the end of your post, I actually haven’t been informed of them! I like the first story of the father throwing his son in the air. Their precious moments were just exaggerated a bit, and boom goes the power of social media making it viral, to the point the simply exaggerated photo was more eloquently exaggerated! Too bad they didn’t earn even a single cent for all those shares/views. As for the woman who stole a friend’s baby photo for evil reasons, she deserves her punishment. Getting back at someone never did anything good for everyone. PS: I think there’s something wrong with your Commentluv plugin..
And yes, people can manipulate photos and chop off watermarks – but that makes them knowing, willful infringers, doesn’t it? Kind of takes away the whole argument about thinking it was in the public domain. There’s a little program you can use on the web, http://tineye.com/ – not perfect and their database doesn’t contain EVERYTHING, but a cursory search of that image you want to share MAY help you to find the creator of it. Strange. I think it’s working again – and I did absolutely nothing to fix it. Let me know if you have any more problems with it! I really dig what you’ve done with the place here! I tell you what, I was getting down on your jalapeno story then BAMB it turned into a lesson on copyright…lol I thought the lead in was ingenious. I have definitely had my run ins with scalpers and it’s not a whole lot of fun to deal with. I’ve had pretty good success with Google removing my content from sites that had stolen it, so I’m blessed at that. I certainly do my part to ensure any images I use are carrying a creative commons license or come from a royalty free site. I know how it feels to see your content somewhere else and suddenly get that gut wrenching feeling inside. From one publisher to another, we know what hard work is all about and to have someone else steal your hard work is not a very good way to start a day. Anyway, just wanted to pop in and say hi and check out some of your work, hope you have a great day! Oh, Robert – I’m so glad you thought it “ingenious” and not just “jarring.” I’ve resolved not to write anything here that is not candidly “me.” I did want to write about the Add Watermark plug-in, having been quite impressed with the responsiveness of the developer. I also wanted to use my own images to illustrate. And quite frankly, most of my readers either don’t give a rat’s nose hair about copyright issues (or are sick to death of hearing me rant about them). So in order to keep everyone happy, I tried to weave it all together in a way that (for better or worse) reflects the way my mind sometimes plays connect the dots. I hope it’s a little less confusing – even if it’s a whole lot less “literary” – than reading James Joyce. In all seriousness, THANK YOU for following the breadcrumbs I left over on your blog. I sometimes wonder if anyone bothers, these days. The relative lack of fun conversation back and forth, sometimes stretching across various posts, takes much of the fun out of blogging, I think. Really glad you dropped by – hope you’ll settle in and make yourself at home. UPDATE: Turns out this is not a jalapeno pepper at all, but a pequin pepper. They are edible, and quite a bit hotter than the jalapeno pepper, if you can beat the birds to the harvest.